There are few fish more exotic and unusual than the puffer. With very specific environmental needs they present a real challenge to keep and are recommended only for the experienced aquarist, but they're fascinating creatures and will provide a great deal of satisfaction in return for your hard work. Although some species are happy in freshwater tropical aquariums, most puffers prefer a brackish environment, and you'll need to get the amount of salt in the water just right for them to thrive. After adding marine salts to the tank, you should use a hydrometer (cheap to buy and simple to set up) to monitor the salinity of the water and adjust it to the preferences of the particular species you're keeping. All puffers need very clean water with low ammonia and nitrites. Because their needs are so specific, it's difficult to keep puffers in a community tank. They are often happiest all alone. If you keep several puffers together, they should be the same species, and you should make sure that your aquarium contains plenty of hiding places. Puffers are carnivorous fish and should be supplied with a varied diet including plenty of crunchy foods such as snails and crustaceans. This is especially important because they are toothed fish and their teeth grow continually, so they must be able to grind them down. Even with the best care, you can expect to have to take your puffers for dental work every few months. 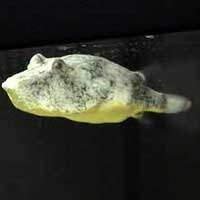 Puffers are also prone to obesity, so once they reach adult size you should feed them just once every two to three days, no matter how much they beg. What makes the puffer so famous is, of course, its ability to inflate its body, increasing its apparent size to deter predators. Many people buy puffer fish because they are excited about this and hope to watch it happen on a regular basis. This is not a good idea. Puffing up is very stressful for the fish and can lead to health problems. It can also cause immediate damage if the puffer accidentally draws in air instead of water when inflating. The puffer will then have difficulty expelling air and will lose control of its buoyancy. For this reason, puffers should never be lifted out of the aquarium in a net, but should always be surrounded by water when moved. Abei Puffers - This small, hardy fish changes its colour and pattern according to its mood. Prone to bursts of energy and aggression, it should be kept alone in fresh water. South American Puffers -Vividly coloured and highly active, these fresh water fish can usually be kept in a shoal. Their fast growing teeth require comparatively frequent dental work. They require especially good filtration. Dwarf Puffers -These tiny, brightly coloured fish can be kept in a shoal, but you should always be ready to separate them in case of problems. They are intelligent and relatively hardy. They need a fresh water environment. Figure Eight Puffers - These charismatic, strikingly patterned little fish can be kept in a shoal but are prone to aggression. They need brackish water and will only accept live food. Ceylon Puffers -Comparatively peaceful, these handsome striped fish can be kept in shoals. They need brackish water when young and a full marine environment when adult. Dog Faced Puffers -These curious fish grow up to a foot in length, so require plenty of space, but are comparatively tolerant of other fish. Don't try to keep them in a reef aquarium or they'll eat your coral. They need a marine environment and are fairly hardy. Although it's difficult to keep puffers successfully, hard work, research and patience will pay off. Puffers live for a long time and are notably intelligent. They pay attention to what's happening outside the tank and will enjoy your companionship. If you're prepared to put in the effort, keeping puffers can be a wonderful experience. I have been keeping green spotted puffers and figure eight for a few years now, they are in brackish water.They live quite happily together along with 3 scats. They are beautiful fish to keep.